Finding a new apartment in Moscow is a minefield for those who are not in the know. A world of fickle agents, “babushka-style” interior decoration and uncontrollable prices awaits the apartment-hunter, so it is crucial to be aware of the issues. RBTH web editor Kira Egorova shares her tips on how to hunt for - and find - a new home in Russia’s capital. 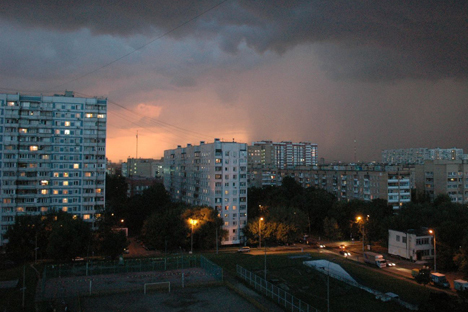 Moscow has an extremely chaotic rental market. Apartment owners can apply to several agencies at one time, pricing is hardly transparent and realtors have a habit of not calling back. But in spite of these difficulties I successfully managed to find a new apartment - largely because I drew ​​important conclusions from my own previous failures and the bad experiences of my friends. I rented my first apartment three years ago in September. Never do this. In September, the real estate market in Moscow is unimaginable – this is the time when students and workers from the regions flood into the city. Realtors and tenants are about to go crazy with such diversity - and in September, prices rise faster than ever. Sometimes during September prices get so out of hand that in October they have to cut them again. Rental rates for apartments in Moscow typically rise by 5-10 percent per year. This means that if today you take a one-bedroom apartment near the Moscow Ring Road for $1,000 (35,000 rubles) per month, you should not be surprised if in a year, when you move out for some reason, this apartment is valued by the realtor at $1,100 , and two years later - at $1,210 . The trick is that prices usually do not increase for permanent tenants who rent an apartment for more than a year. A friend of mine has been living in a one-bedroom apartment near the Sokol subway station for 10 years and still pays rent equivalent to 2004 prices – $560 (20,000 rubles) per month. Now all you can get for that price is a room in a three-room apartment in the suburbs. There is an expression “babushka style”, used to describe so-called apartments that have not been updated for more than 20 years. Here you may see the inherent attributes of the indestructible Soviet past that belong to any Russian old lady or babushka: a wardrobe and dresser unit with an old china tea set, a dusty carpet on the wall, a balcony with a broken bike and an endless number of shelves put up during the Brezhnev era. These are the cheapest apartments in Moscow - they cost about $790 (28,000 rubles) per month. Prices for higher class apartments start today from $1,130 (40 000 rubles) - for this money you get a convenient location near the metro, modern appliances, furniture, intercom and not even the slightest hint of Brezhnev. Nice apartments in Moscow get snapped up like hot cakes. Once I found a perfect apartment in the ads, and a realtor suggested that I come and have a look at it in 30 minutes. I was surprised and said that just getting there would take me at least 40 minutes. When I got there 40 minutes later, the apartment had already gone. Ever since, I have persuaded realtors to show me the apartment as soon as possible. A large number of flats and rooms are available for rent through private ads on the Vkontakte and Facebook social networks. This is an attractive option because it excludes the participation of agents, who typically charge a commission fee of up to 100 percent of the monthly rent. I have many friends who found a home by themselves through ads on social networks. However, there is always the risk of running into scams. And the latest thing to strike me is the "support group". I encountered this unique phenomenon a week ago, when I came to rent my new apartment. When I came last Monday, it was a bit crowded: In addition to the landlord and my realtor, there were six other people in the room who had also come for the viewing. Almost immediately it became clear that these people represented one customer! One young couple had taken a couple of friends and two realtors along for "moral support". This enthusiasm frightened the landlord so much that he came to my realtor and offered us a discount if we made a deal immediately. Hence, there are two morals to the story – keep calm and believe in luck. Now you live in Moscow! UPD:When Ipublishedthis blog, my disgruntled friends sentme a lot ofcomments. It turned out thatI forgotthe most importantpart -to publisha picture of me in myapartment.Here I am!